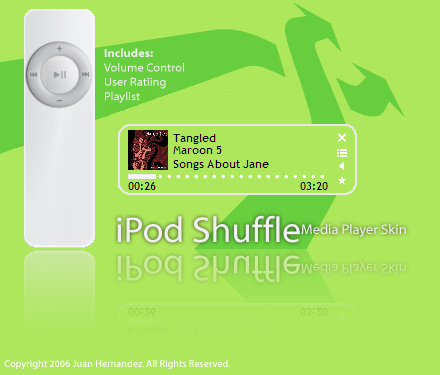 I mentioned a long time ago that I would update my iPod Shuffle skin. After many modifications it is ready. In this vesion, I have removed the some buttons and added some as well. One of the buttons removed is the Return To Media Center button. You can alway return to it by pressing CTRL+1. I also removed the minimizing button, now it will close the player. A featured added to the skin is the free form panel. In the panel the media currently playing is displayed as well as other features. Some of the freatures added are: Playlist (With QuickAccessPanel by clicking on Playlist text when playlist is open. ), User Rating, Volume Control and AlbumArt. Hope you enjoy this update. I like it, but please make that green thingy transparent.. please? please? please? the green's just not going well with my wallpaper.